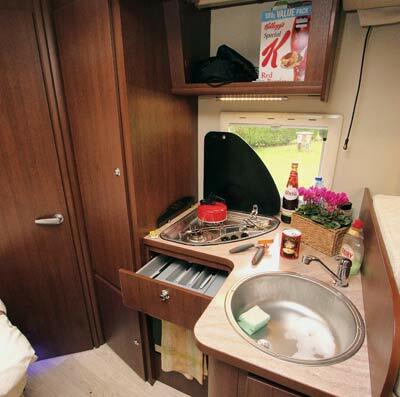 Only now has the Italian pairing of CI and Roller Team (think same ’vans, different stripes, different upholstery) launched the first examples of the popular A-class-style drop-down transverse bed with the cheaper-to-build bodywork of a low-profile motorhome. With a starting price of under £45,000, the S and T duo are off to a good start, but then these are brands that are as associated with keen costings as Lidl and Kia. Their bold décor doesn’t look cheap, though. What really matters, however, is that bed. And as CI have no pedigree in A-class motorhomes (where these beds originated) you might wonder if this would be their downfall. But no. The bed didn’t rattle on route and its simple sliding handle and manual raising and lowering are hard to fault. Better still, unlike most, but not all, rivals whose beds are simply up or down, the S-Line has a third position. When stored, the lowerable bed leaves room for a thin duvet and pillow on top. Not all do. And when pulled right down it offers generous headroom (29in), a thick and comfy mattress, and it doesn’t interfere with the doorway or the kitchen. 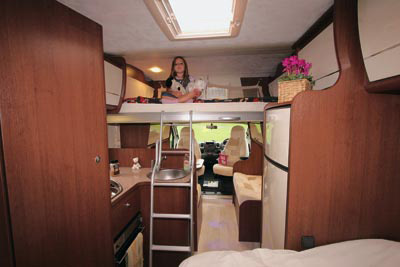 Then you discover that the bed can be lowered part-way, while still leaving enough headroom to sleep – similar in fact to many overcab beds in luton-style coachbuilts. This motorhome has a bold-looking interior, from the overcab opening skylight to the net curtains of the airy rear bedroom. An automotive-style ribbed headlining under the bed and swivelling LED striplights only serve to enhance the up-to-the-minute feel. There are no lights at all in the cab, no light switches by the entrance door and the only overcab storage is in safety-compromising open shelves. Unusually, the TV point is above the driver, but you’ll have to pay your dealer to add the bracket, as well as the flatscreen and aerial. The lounge does feel spacious though, with plenty of natural light. Height is not an issue in the kitchen, which boasts 6ft 6in of headroom. A three-burner hob is mated to a combined oven and grill below, and a huge AES-operation fridge/freezer opposite. A cut-out in the worktop does not reveal the expected bin, though – just an odd little extra cupboard. Up above, meanwhile, the top cupboard is tall enough for cereal packets. That’s because it, like all the S-Line’s upper lockers, lacks a shelf inside. Combine that with the fact there are just three high-level cupboards along the offside and you start to question the CI’s storage potential. It’s a good thing, therefore, that the side-facing settee provides a usefully large locker underneath and the under-bed area is big enough to cope with all your outdoor furniture and the like. The wardrobe, too, is a decent size and washroom storage is as good as you’d hope for. When you emerge from the shower the Truma Combi heating should have the ’van comfortably warm for you, though you’ll have to pay an extra £600 if you want electric power as well as gas for your heat and hot water. 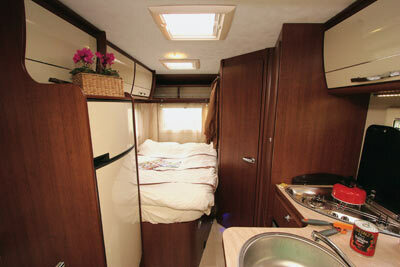 This motorhome does have foibles but we do like the décor and two-position bed. A 75mm thickness to the floor and Styrofoam rather than inferior polystyrene insulation are real pluses on a relatively budget-priced vehicle. 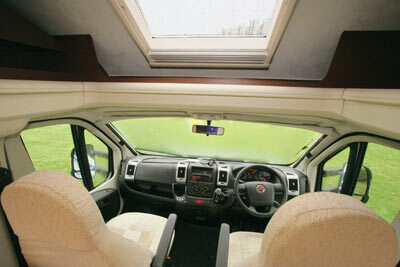 * Motorhome insurance based on 2012 CI S-Line valued at £44,390. Fitted with CAT 1 Alarm and Immobiliser system. Kept on driveway at home at TD9 8ED. Motorhome owners – professionals over 50 years old with no claims, convictions or health conditions in last 3 years. 4 years no claims bonus mirrored from car policy and 2 years motorhome driving experience. Members of motorhome club doing less than 5000 miles annually. £250 excess applies. European cover £21.00 Extra. European Breakdown £43 extra. Premium includes Insurance Premium Tax (IPT) at 6% and is correct as of 15.12.11. The problem has now been sorted out and looks like I might have jumped the gun a bit about Go European Motorhomes and Caravans in Gailey, on Friday the did phone back and we drove there on Saturday and was able to wait while they fixed the fault which was the fuse box and control unit all is working okay now. Many thanks to David at Go European Motorhomes and Caravans. Not very happy with mine, have had problems with the electrics since we got it in February, The electric board above the door into the van has been replaced, and we are still having problems with it. Once again we have no electric in the van. We brought it from Go European Motorhomes and Caravans in Gailey and we are not getting a very good customer service from them. I am very upset, I thought we would be able to get away more now and enjoy our retirement with this new van. The Rollerteam T line range is available to order in automatic mode for May/June 2012 delivery. 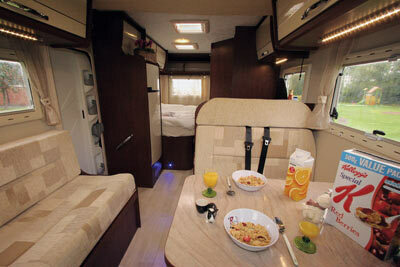 Why is it that motorhome manufacturers cannot produce vehicles with the same number of travelling seats as berths? For the money it looks good enough to me but, and it’s a BIG BUT, some of us motorcaravanners need vehicles fitted with an automatic gearbox. I was very interested in the new Bailey Approach only to be told that there would be NO automatic versions being built in the foreseeable future. Will this CI be fitted with an automatic gearbox or is it yet another reasonably priced ‘van that I have to cross off the ever diminishing list?